The installation cost of a 100 KW solar power plant is about Rs 1.5 crore. RANCHI: Solar energy is illuminating 13 out of the total 24 district courts in Jharkhand, where erratic power throughout the year is not something unheard of. 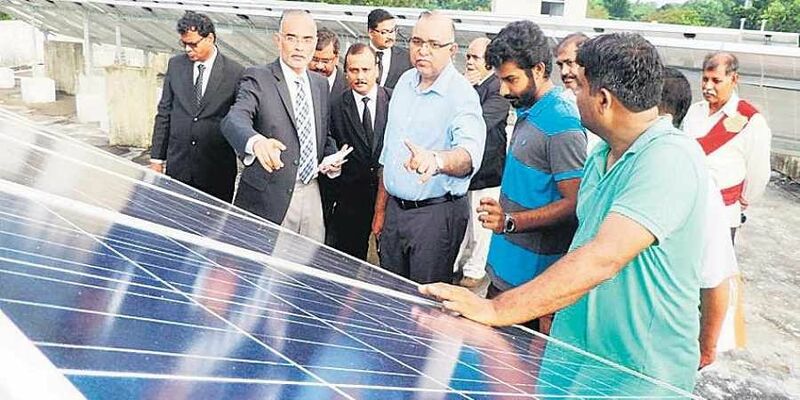 Officials of Jharkhand Renewable Energy Development Agency (JREDA) claim the solar panels at these district courts not only produce 1,380 KW of energy but also saved several hundreds of trees in last three years. Also, the power generated during court holidays is transferred to other grids, which work to meet energy needs of other consumers.“Besides benefits such as zero carbon dioxide emission and no running cost, solar energy helps in protecting trees. One kg of fossil fuel is consumed in producing 1 KW of electricity,” says JREDA Managing Director Niranjan Kumar. As many as 3,322 trees were saved ever since the first solar power plant was installed in the Khunti district court on October 2, 2015, he adds.“So far, we have been able to prevent 4,89,847 kg of carbon dioxide emission, thereby contributing positively towards a clean environment.”JREDA executive engineer Sri Ram Singh tells The Sunday Standard that uninterrupted power supply has contributed to better judicial work. Installation costs are recovered within six years, he assures. The installation cost of a 100 KW solar power plant is about Rs 1.5 crore. By August 15, the Rajmahal district court will join its counterparts at Khunti, Sahibganj, Garhwa, Simdega, Chatra, Ramgarh, Koderma, Latehar, Jamtara, Pakur, Godda and Seraikela-Kharsawan to operate completely on solar power. Singh said there is also a plan to install solar power plant in the district court at Jamshedpur. Efforts are on to get a suitable piece of land for the purpose, he adds.